Thursday January 24th 1895 I was busy with the work all forenoon. I fried a pan of doughnuts. Will went for wodk and when he came back Frank Stackman came with him to bring a couple of cows he sold to Will. After I got the dinner work done Will and I went to town. I went to the Missionary meeting at Mrs Mains. It is growing colder with a prospect of snow. I read all the evening. Friday January 25th 1895 It was snowing and blowing this morning and proved to be a terrible day. The men could do nothing out of doors. I baked bread and cake in the forenoon besides getting dinner & wrote letters in the afternoon to Mrs Fuller May & Laura Mason. In the evening I wrote to Ella Hamilton. Saturday January 26th 1895 The storm had ceased this morning. The boys were all the forenoon digging out the paths and a way to get to town. Will went down uin the afternoon. I was busy in the kitchen all moring and did some sweeping and cleaning up in the afternoon. I read and wrote in the evening. Sunday January 27th 1895 We were at home all day spent most of the time reading. I wrote to Flora Culbertson in the evening. David was in town all day. weather very cold. 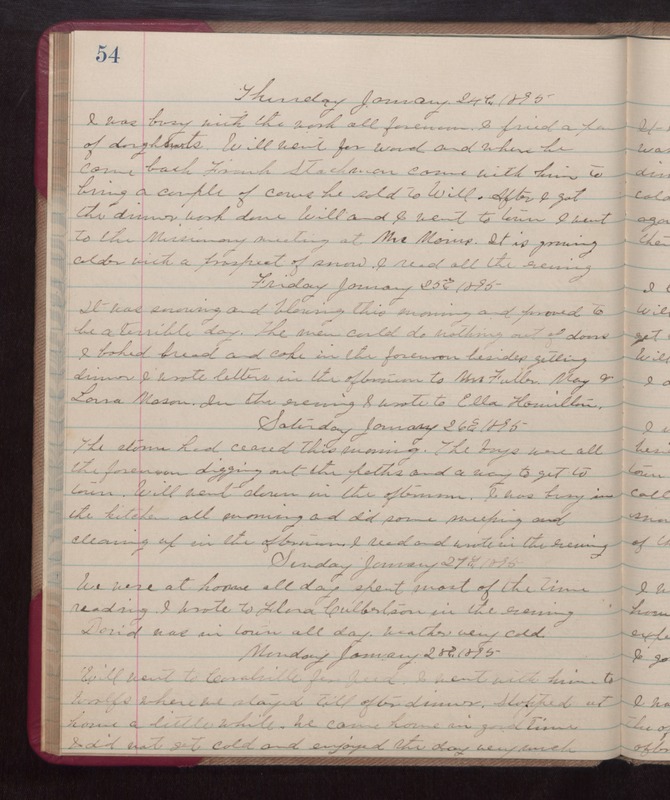 Monday January 28th 1895 Will went to Coralville for feed. I went with him to Woolfs where we stayed till after dinner. Stopped at home a little while. We came home in good time I did not get cold and enjoyed the day very much.